Rallies are held to oppose plans to store highly radioactive waste underground: the expensive and dangerous long-term by-product of France's nuclear energy programme. A lot of money has already been spent for this hotly contested project. The first step towards the implementation of the storage site known as Cigeo (Centre Industriel de Stockage Géologique) was the construction of the Meuse/Haute Marne Underground Research Laboratory. It is located 500 metres underground in Bure (North Eastern France) in the Meuse department allowing the study of the geological formation in order to evaluate its capacity for deep geological storage of high level and long lived medium level radioactive waste. It is managed by the 'Agence nationale pour la gestion des déchets radioactifs' (Andra). Its construction began in 2000, having been underway since 1994 as a result of the 1991 law on the management of nuclear waste. The signature of a contract between ANDRA and a joint venture of two engineering companies (Technip and Ingérop) in the beginning of 2012 ended this phase of study and research. With regard to the repository, on one hand, there is an ongoing public debate; on the other hand, ANDRA had to present a blueprint to the government in 2014; if approved by the French National Assembly in 2016, construction would begin the following year. The assembly will then consider licensing the facility to open in 2025. The facility is anticipated to operate for 100 years before final closure although the storage would be reversible. Nuclear power used to enjoy fairly good cross-party support in the country, and the economic incentives that the storage facility offers to the Bure region have been welcomed by many locals. Anti-nuclear groups also have little clout. Nevertheless, some small organizations (Burestop 55, Bure Zone Libre and EODRA) are opposing the project and showing their discontent organizing several actions and events. In 2017, a local farmer, J.P. Simon was brought to court for lending a tractor to demonstators ("zadistes", as newspapers called them). The Confederation Paysanne supports him. (See also a very informative article in the Financial Times in 2016, in Sources and Methods (2), and the update on the demonstrations in 2017 in the section Project Details). Project Details 15 square kilometre of underground storage facility in a geology of thick layers of argillite rock. Disposability reversible at least for 100 years. Designed to hold French military and civilian atomic waste classified as having intermediate and high levels of radioactivity, some of which can remain dangerous for more than 100,000 years. Update.- 2017. There have been local demonstrations from time to time by what newspapers call "zadistes". On August 15, 2017, "Police used water cannon and fired tear gas and stun grenades as they battled with demonstrators protesting at plans to store nuclear waste... Protest organisers said six people were badly hurt and about 30 lightly injured in the clash in Bure. The local prefecture said that, according to calls to the emergency services, at least three demonstrators had been injured. Two gendarmes were hurt by a "home-made device thrown by protestors", the prefecture said... The rally was held to oppose plans to store highly radioactive waste 500 metres (1,640 feet) underground at a nearby site -- the dangerous long-term by-product of France's extensive nuclear energy programme. 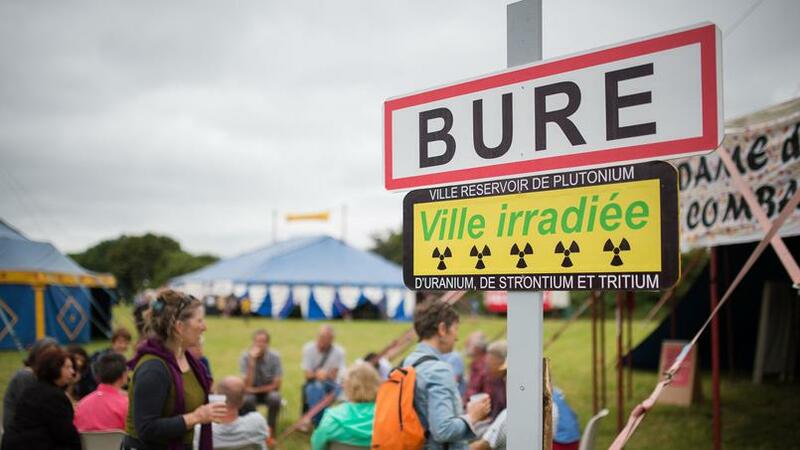 Debate over Bure has been raging for years, pitching France's vocal environmental lobby against its powerful nuclear industry. In July 2017, the National Agency for the Management of Radioactive Waste (ANDRA) said construction of the storage site would start in 2022 at the earliest. But earlier this month (August 2017), a national watchdog, the Nuclear Safety Authority (ASN), declared it had "reservations" about the project." The cost of the project could go up to € 25 billion . Environmental justice organisations and other supporters BURESTOP 55 - Collectif Meuse contre l’enfouissement des déchets radioactifs, Bure Zone Libre (BZL), EODRA : Association des Elus de Lorraine et Champagne-Ardenne Opposés à lenfouissement des Déchets RAdioactifs et favorables à un développement durable. Confederation paysanne. - Protest house: a gathering place for educating and campaigning against the Bure final disposal plans. - boycott of participation in official processes. Demonstrators wounded. Criminalization of farmers who support the struggle. Development of Alternatives - Change energy policy: move, in a balanced way, from nuclear power to safer sources. - Try to minimize transport of nuclear waste and empower the whole community to decide on what to do with the existing waste. Why? Explain briefly. The project has not yet been approved and the final decision is subject to the outcomes of the ongoing public debate phase. The opponents have decided to boycott the public debate arguing that the decision has been already taken, claiming it is a false debate. 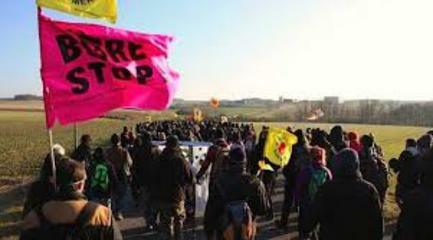 There are local demonstrations against the project. sometimes turning violent. Law 91-1381 from 30th December 1991 called Bataille law. Law 2006-739 de programme relative à la gestion durable des matières et déchets radioactifs from 28th June 2006. Huvelin, P. LANDRA, la transparence et la démocratie: déchets nucléaires et hypothèque de la géothermie en Lorraine, mars 2009. Mourot, A.; Godinot, A.; Huvelin, P. Synthèse de la Négation du potentiel géothermique de Bure, Synthèse, 10p., novembre 2006. Protesters clash with police at anti-nuclear demo in France (AFP). In Bure on the 15 August 2017, around 800 people set off on a demo (numbers like this had never been seen before for a non-declared demo in Bure). The prefecture deliberately chose a strategy of aggression and asphyxiation that led to a number of injured people. Déchets nucléaires à Bure : le procès d'un agriculteur pour avoir prêté son tracteur à des zadistes. 2/5/2017. À Bure, l’Andra veut étouffer la lutte paysanne. 2 mai 2017 / Lorène Lavocat (Reporterre). Pour s’assurer la maîtrise de la zone de la « poubelle nucléaire » de Bure, l’Agence nationale de gestion des déchets radioactifs s’est constitué une immense réserve foncière. Si de nombreux paysans ont cédé aux conditions de l’Agence, ce n’est pas le cas de Jean-Pierre Simon, jugé ce mardi pour « complicité » avec les antinucléaires. La Confédération paysanne le soutient. Surce: Nicole Guiraud, FT, 14 July 2016.